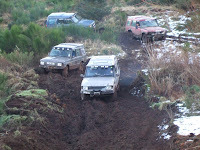 Two more clubs have decided to visit our site this Autumn, on Sat 7th Nov the Scottish Mud Club is coming and on Sunday 29th Nov Ross is bringing the Scottish Land Rover Owners Club along. Lots of rain in the past 24 hours and the site is very slippery again. I taught a very able lady teacher on saturday morning for her 40 th birthday surprise and she had a great time sliding the vehicle around all over the place. Her next activity was a flying lesson!! Now that the crops are all cleared from the fields we are seeing a lot more deer on the site again, they can hide easily in amoungst the trees and bushes and are not too scared of the Land Rover, we are getting really close to them now. 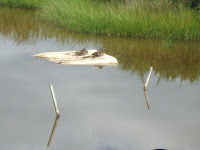 The photo is of our resident ducks on the Land Rover roof!!!!! Hello everyone. This is my first proper blog. The big news this week is that we have put up our prices (after 8 years!!) The club membership, however, stays the same at £150 as does the full day adventure at £300. We believe we still offer fantastic value for money!! Other news is the white Land Rover had to have major welding done to the front suspension, caused by using too many rough descents. It also had the engine management relays replaced as they had been damaged by water over the years and were causing starting problems. Many thanks to Mike Aitken and his team yet again! !